The weather is cold, and I’m cooking up a storm just to keep the kitchen warm. 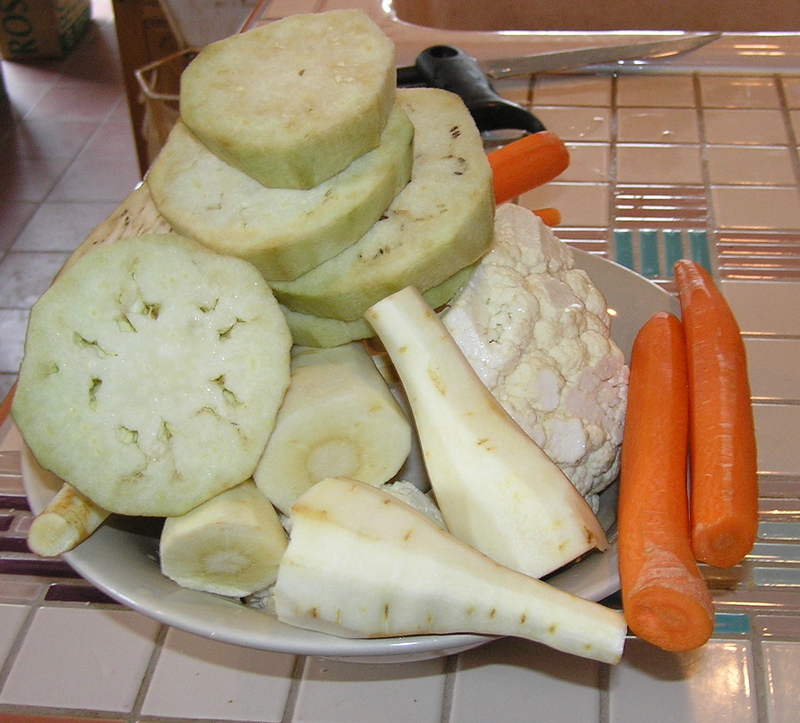 Last weekend I made a huge pot of chicken soup, to which I added barley and vegetables. It’s packed in the freezer for hot lunches at work – and occasionally for dinner when I’m freezing and tired. I’ve been craving baked goods, and was looking for a recipe that could be made in an 8 or 9 inch cake pan. This is just large enough when the purpose is eating it at home, and not taking the goodie to a potluck where most of it will be eaten and only a bit left for me. Really, contrary to the opinions of many I lack will power and my chief strategy for restraint is not having too many things to tempt me in the house. A whole Bundt cake would just call out to me to be eaten several times a day. Lightly spoon flours into dry measuring cups; level with a knife. In a medium bowl, whisk together flours and next 4 ingredients (flours through salt). 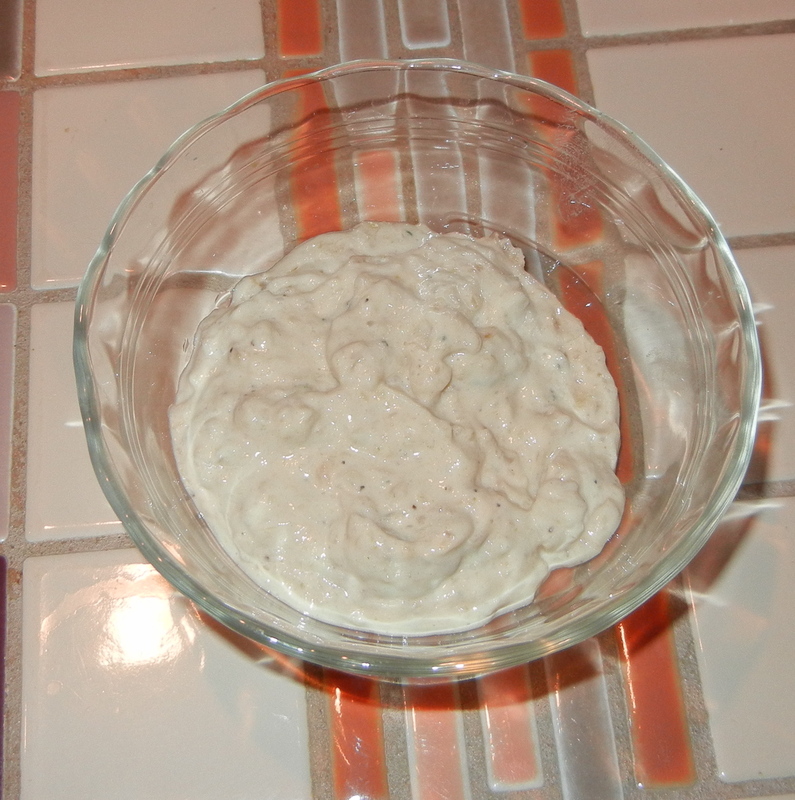 Place egg and egg white in a large bowl. Beat with a mixer at medium speed for 30 seconds. Add brown sugar, pumpkin, oil, butter, applesauce, and orange rind. Beat until well blended. Add flour mixture to pumpkin mixture, stirring just until moist. 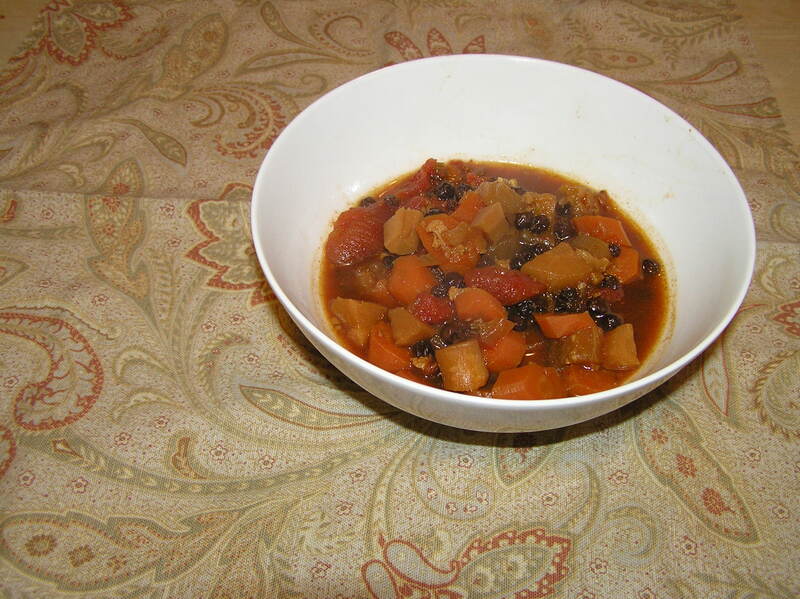 Stir in raisins, carrot, and cranberries. Spoon batter into prepared 8-inch square baking pan. Sprinkle with pecans. Bake at 350° for 25 minutes or until a wooden pick inserted in the center of the cake comes out clean. Cool in pan 10 minutes on a wire rack; remove from pan. Cool completely on wire rack. Makes 16 pieces at 2 grams of fat/piece. This is the cake I was making when my beloved old Olympus camera broke. I’m still not used to the pictures the new one takes. I am spending Christmas Eve making something to take to my neighbor’s house tomorrow for Christmas dinner. They requested a side dish and, because I couldn’t decide which to make, I made two – a Moroccan carrot salad and a broccoli gorgonzola casserole. Both of these are make-aheads, which is exactly what I want so I can have a relaxed Christmas morning, which I hope will include a long soak in my giant bubble tub. The broccoli awaits the crumb topping and baking tomorrow, so here is the salad. This recipe, originally from the New York Times, includes rose water, which can be gotten in some super markets and in Asian stores. Rose water is very evocative to me. I open the bottle and I am transported back to Mumbai, where I sit, sari-clad, on the flat roof of our apartment building. It is evening, and the other women in the building are also on the roof, eating bhelpuri (a puffed rice, cilantro and savories snack) and sweets scented with rose water. We laugh, talk, and tease one another in a brief respite from days spent cooking for husbands and tending children. 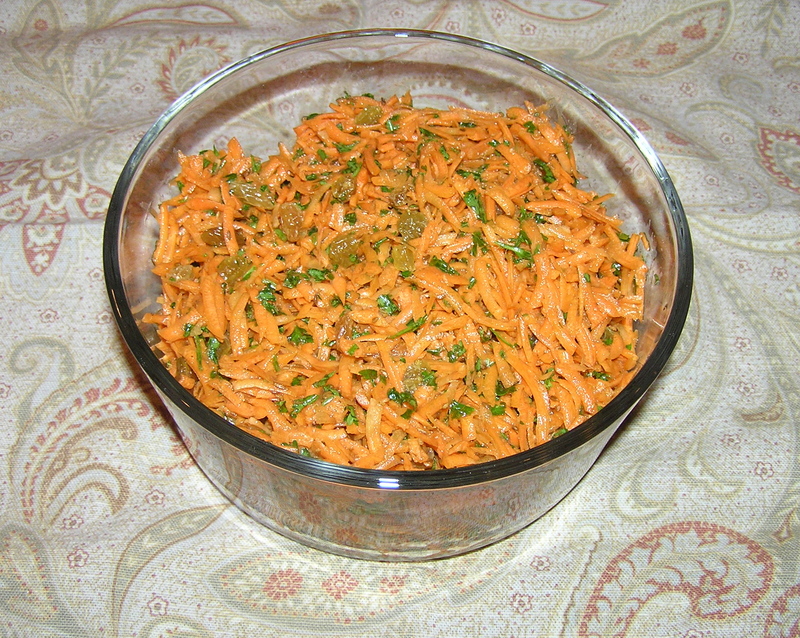 The rose water in this salad is not very strong, but it gives the carrot a slightly mysterious flowery essence. Toast the coriander and cumin in a dry pan over medium-high heat, shaking often to avoid burning, until just fragrant and slightly darker, about 3 minutes. Although the recipe did not call for it, I crushed the coriander and cumin in a mortar and pestle so the pieces in the salad would be smaller. I think you can use them either way. Combine spices with remaining ingredients in a bowl and mix well. 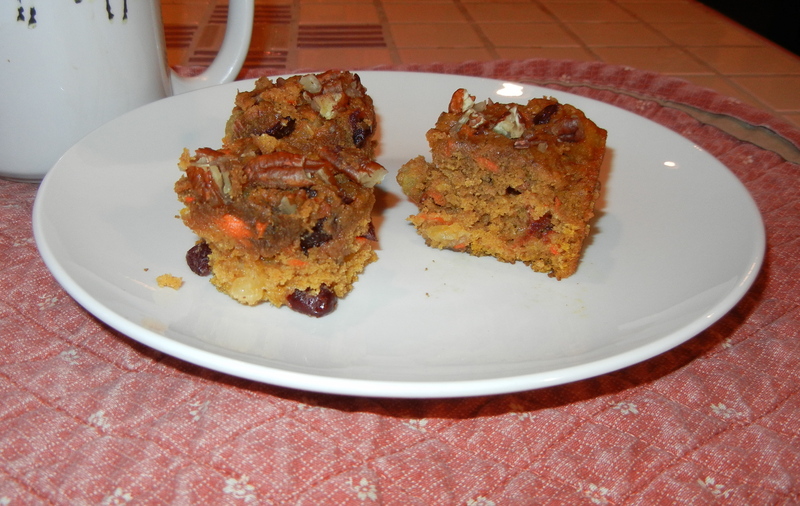 I added a tablespoon of sugar at this point because my carrots were not very sweet. Refrigerate, covered, for one hour or up to 24 hours. Stir before serving. Makes 6 servings at about 3 grams of fat/serving. *What, you may ask, is a nice Jewish girl doing with a Christmas tree? 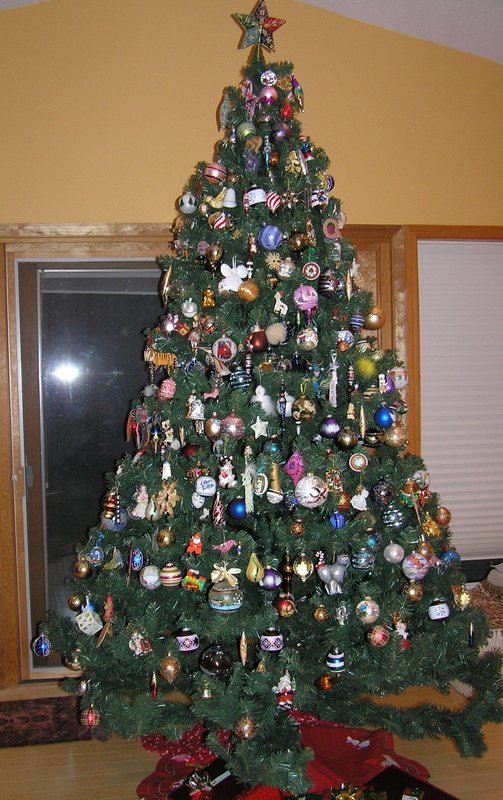 I have been collecting ornaments for over 40 years. It all started innocently with an ornament received as a gift, and now anyone who knows me will tell you I am obsessed. There are no lights on my tree to detract from my precious ornaments, and I hang each one and remember where I got it and why. It is like a memory book I open each Christmas. 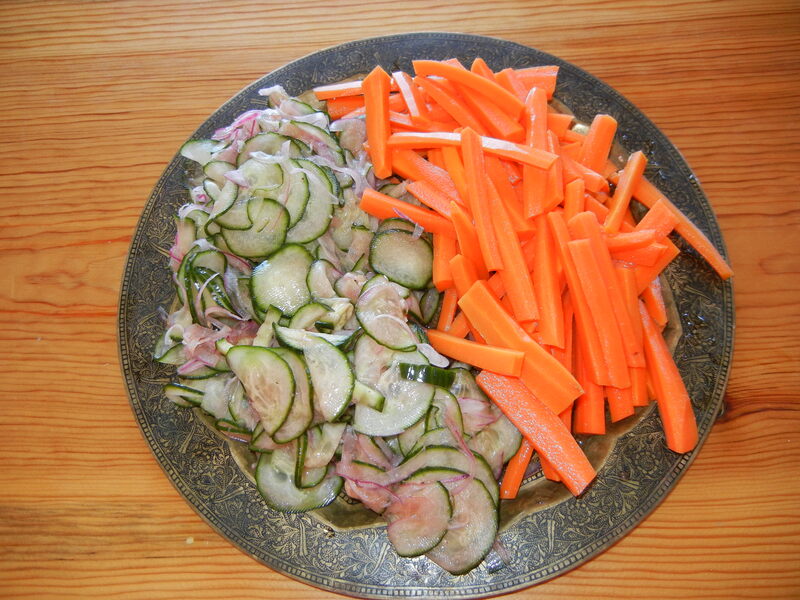 This is a quick salad that makes a good buffet or potluck dish. The carrots with the slightly sweet and sour spiced dressing is quite refreshing. I served it chilled, but it holds well enough without wilting to serve at room temperature. 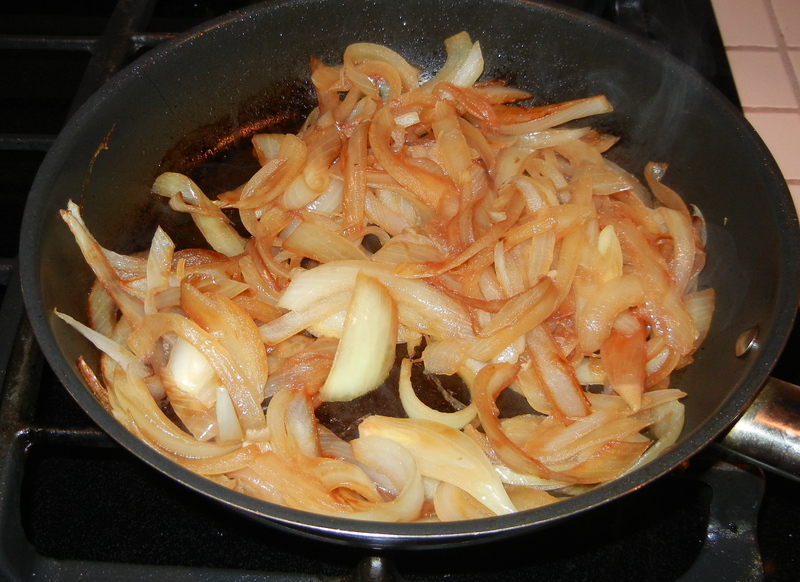 The original recipe is from Cooking Light. 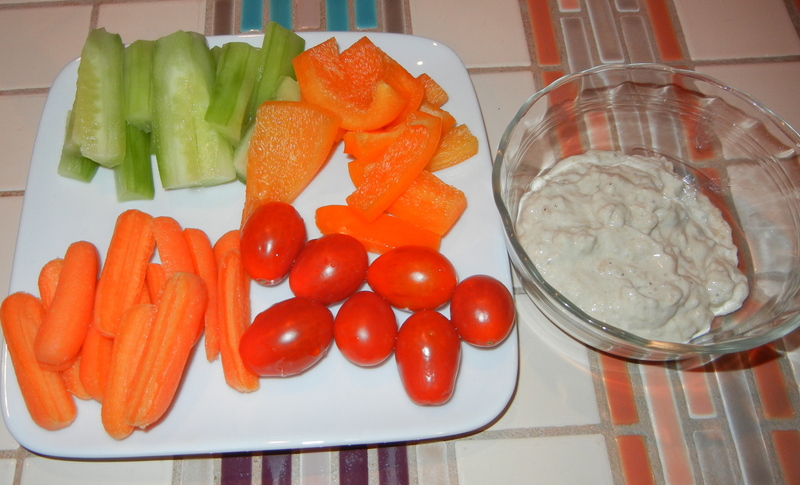 I used baby carrots, because that is what I had in the house. 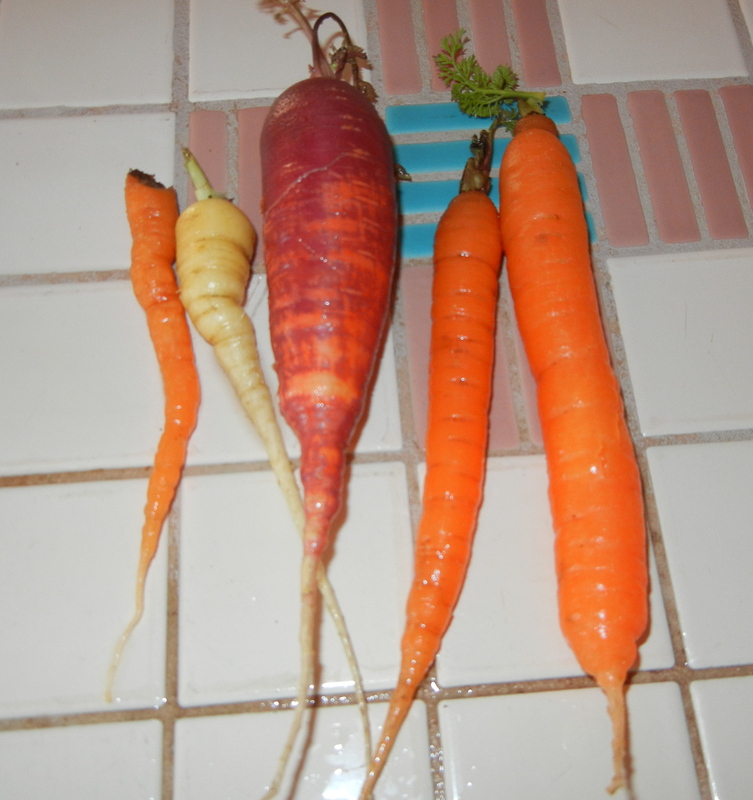 Regular carrots would work well, but I would choose slender ones rather than big soup carrots. Combine carrot and garlic in a large saucepan. 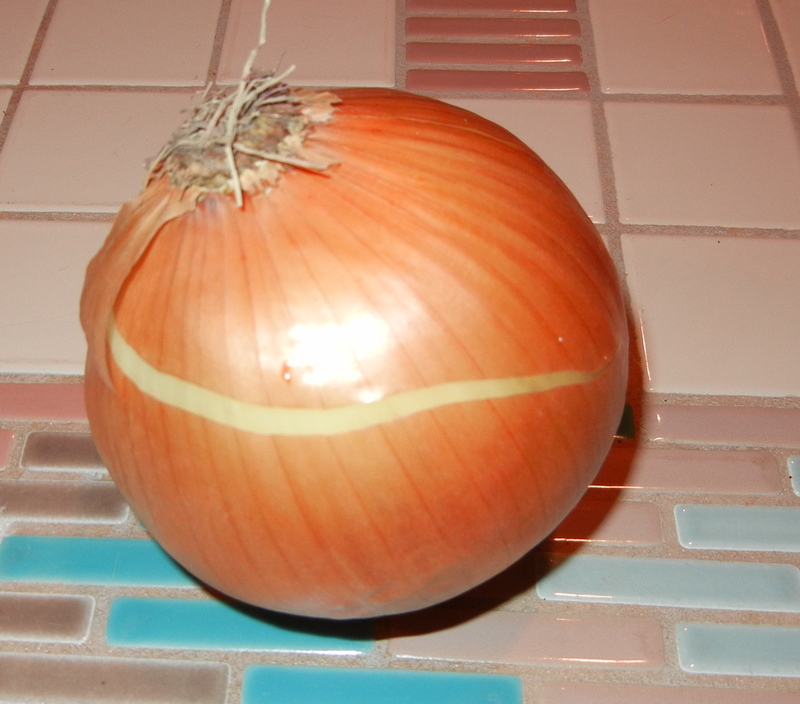 Cover with water; bring to a boil. Cook 8 minutes or until tender; drain. Discard garlic. 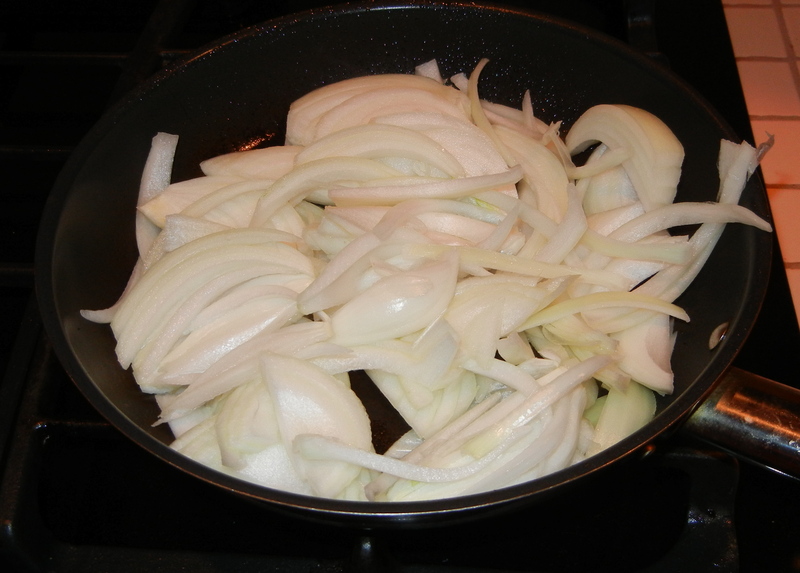 Combine lemon juice and remaining ingredients in a medium bowl, and stir well. Add carrot to lemon juice mixture, tossing to coat. Serve salad at room temperature or chilled. Makes 8 servings with virtually no fat per serving.